Tonight we received more bok choy and chinese cabbage from the CSA! I had gone to the grocery store yesterday and bought a few different kinds of seitan and some tofu and tempeh so that I had options for all these cabbage-y vegetables. We had a stir-fry of tofu, bok choy, chinese cabbage and a little mizuna for good measure. It was actually one of my better stir fries. I hate how the liquid always cooks away when I make these so this time I doubled the liquid part of the recipe and added more liquid as needed. I like my rice to get all soupy when I eat stir fry! The stir-fry recipe came from Epicurious. The thought I had today about this CSA is that 1. I should invest in a good asian cookbook to give me more varied and creative ideas for using these asian vegetables, and 2. maybe once I’ve done this I can write my own cookbook! I would love to write a cookbook. On Sunday, the 24th, we celebrated Luke’s mom’s birthday by having dinner at her place. Unfortunately, since Michael was out of town, she had to cook her own birthday dinner. And did she cook! She made two desserts and had the sweetest most beautiful cherries on the table too. We had brought her a gorgeous white porcelain double serving bowl as a gift and the cherries were luminous in it. Dinner was her “company special”: polenta with ragu, a delicious potato salad with vidalia onions, avocado and cucumbers, and a tossed salad with enoki mushrooms and red peppers. Before eating, we held up our glasses for a toast. Luke called out to Chiara: Pick up your glass so we can have a toast. So, Luke, Nana, Monica, Melanie and I held up our glasses and Chiara held up her plastic and we toasted to many more years for Grandma Mimi. We joined a CSA this season and received our first weeks’ produce on Tuesday. There is sooo much here that I’m not sure how i’m going to keep up. But surfing the web for recipes helps. We received not one, but two enormous bunches of mizuna, red and green, and since it’s so delicate, we need to consume it quickly. We also received two kinds of soft and beautiful lettuces, two heads of bok choy, an enormous chinese cabbage, rhubarb and flowering sage. We already made a strawberry rhubarb pie with the rhubarb we got. That was an adventure. Luke and I had never made strawberry rhubarb pie nor had either of us ever cooked rhubarb. We each sampled a piece of the stalk and could not believe it would make an edible pie, but it did. The rhubarb bits added a nice tartness and also a bit of crunch to the delicious strawberries that we bought at the store. Whisk together water, tamari, vinegar, rice wine & sesame oil. Set aside. Heat vegetable oil in saucepan. Cook garlic for 1 minute. Add vinegar mixture; heat 2 minutes. Toss greens, mango & onion in a large serving bow. Pour warm dressing over salad; sprinkle with toasted sesame seeds. I added lightly fried tofu, that i let cooked with the garlic, to make the salad a more complete meal for the family. The verdict: thumbs down, unfortunately. The tofu and mango were a hit, but the wilted greens and red onions in the tamari sauce kind of overwhelmed the dish. 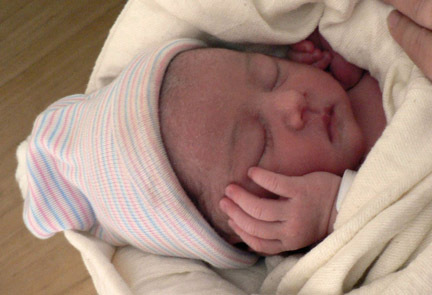 Two weeks early, but perfect and sweet, Jemma Jaehee was born on June 6, just after midnight. Jemma means gem but we spelled it with a J, which for me recalls Jem, the big brother in To Kill a Mockingbird. It’s remarkable how much Jemma looks like Chiara when she was an infant. And I am so proud of Chiara for being such a loving, interested, involved and protective big sister already. Luke and I feel incredibly lucky and privileged to be parents to these girls.